Rwanda Trip: Chocolate Chip Cookies?? Ok. Let me start this post with a simple, yet powerful statement. WE WANT CHOCOLATE CHIP COOKIES!! We miss many things, and have eaten some somewhat strange things since we have been here, including liver this afternoon, but most of all it seems that many of us miss chocolate chip cookies. Note to those picking us up from the airport: see previous statement. The past few days have been pretty busy and draining. 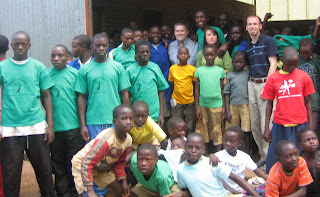 Thursday we went to a school for street kids. There are three levels of classes there, and we visited a math class, a French class, and an English class. Then they had an assembly where we heard some of the kids' testimonies. It was powerful to hear how God had delivered a girl from prostitution and back to school. Brianna and Paul shared their testimonies, and Brian gave the message. We enjoyed some dancing, but those pictures aren't coming on here anytime soon! We were able to hand out t-shirts and balloons, and the kids were very happy to receive their gifts from America. The next stop was the hospital. Don’t worry – it was planned! We visited the Central Kigali University Hospital. This is the hospital that is available to all. Anyone who needs care will be accepted. After sharing in a service with the hospital's ministry staff, we got a chance to visit the wards. My group visited the men's ward and then the pediatrics ward. Wow. I cannot tell you how my heart broke as I saw sick child after sick child. There was a premature baby under the ultra-violet lights who was about the same size as Logan when he was born. I prayed for that baby, as I did for every child that was in the unit. I know that God's heart was breaking, as was mine, as I met the children and their mothers. After that very difficult afternoon, it was a nice change of pace to visit my friend Noel's (see pic) home. 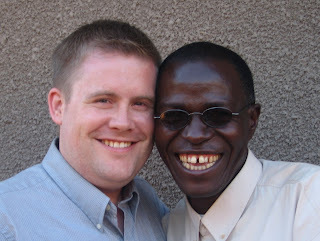 He has been my best Rwandan friend since my first trip here in 2005, and it was such an honor and blessing to be a guest in his home. He has been our driver and guide all week, and the rest of the team has quickly understood why he is such a great guy! Friday was spent with LaRucher Ministry staff at their office. 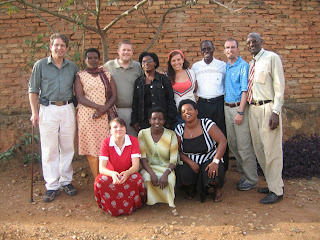 We held three workshops with them, with Becky, Brian, and me leading one each. After, we gave them the laptops that the Valley View folks donated, and they were very grateful. At lunch time we took a break to go visit the units in the King Faisal Hospital, the hospital for those with insurance and/or a great deal of money. The differences from the Central Hospital were striking. We ministered to the patients by sharing testimonies and by praying. Though the conditions were much better than the Central Hospital, it was still a far cry from any Western hospital's standards. Saturday started off with the Expo! The expo is a giant fair with vendor booths and entertainment. We did a ton of shopping, and all of our suitcases will be full when we return! After the expo, we headed to a group of orphans who put on a dancing and drumming show for us. It was great to experience traditional Rwandan culture! Most of us danced (not Paul-he blames the ankle, but I’m not buying! ), but all of us drummed! It was a blast! It didn't even matter that I couldn't seem to keep a beat! After the drumming and dancing, we picked up my friend Joseph from the airport and had dinner in his home. It was fun to be there for his son's and daughter's birthday. It was cute to see them opening their presents. It was funny to see that even in Rwanda people go crazy with scotch tape! This morning was the crusade. There were about 700 people in the service, and the service was over 4 hours long!! I preached and Brian gave his testimony. The choirs were great and many people came forward to give their life to Christ, or rededicate their life to Christ. It was awesome to see God's Spirit working. At the same time, though, I know that I am in the right place at the right time, and that God is working in me/us and through me/us here in Rwanda. Thank you all for your prayers and comments. It is really a blessing to receive emails and comments from home.